Radically authentic and consistently mass-produced. How the brilliant Tolix Chaise A came into being, what it has to say about Modernism, and why it is still in production today almost unchanged. They are ambassadors of a new age—and brothers in spirit. What bentwood is to Vienna, Xavier Pauchard’s “Chaise A” is to Paris—an icon to be enjoyed for the time it takes to drink a cup of coffee and smoke a cigarette. The reasons are obvious—it does absolute justice to the materials, boasts an uncomplicated design and is perfectly suited to its environment. This chair made of galvanized sheet metal is as light as it is robust, as comfortable as it is practical. The ingeniously unpretentious design that “Chaise A” represents was successful not least due to the sum of its good parts. Slightly splayed legs put it on a sure footing and it could also be stacked and tidied away in the twinkling of an eye. Its combination of functionality and straightforward design demonstrated the new, rational aesthetics of the industrial age. No wonder Terence Conran mistakenly supposed that what he was looking at was an American chair when, in 1952, he first came across “Tolix” on a tour through France, immediately recognizing a democratic object when he saw one, a chair for everyone. 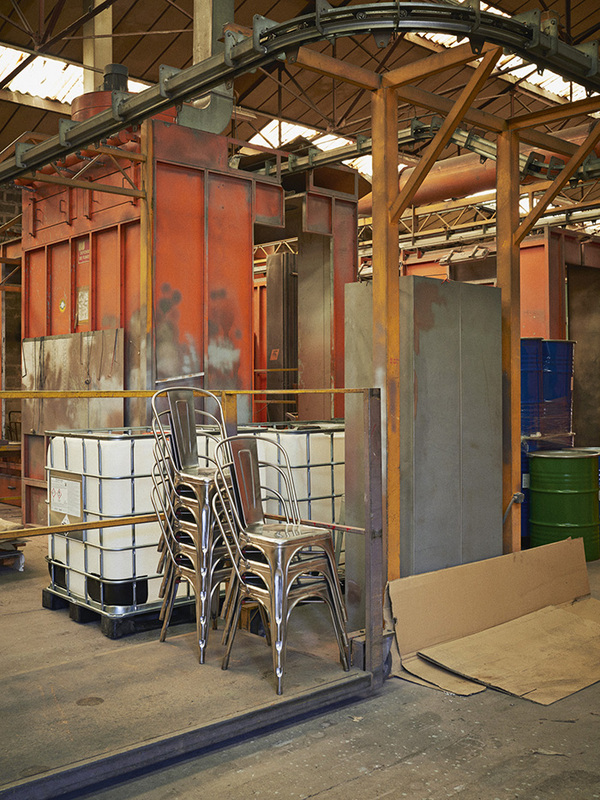 The liquid zinc bath in which the chairs are submerged to guard against corrosion is heated to a temperature of 460°. It was at long ago as 1742 that chemist Paul Jacques Malouin (1701 – 1778) demonstrated this process to his delighted colleagues at the Académie Royale des Sciences but it took some time before it was ready for large-scale production. By the turn of the century household goods, buckets and baths were being galvanized but nobody would have dreamt of extending the technology to metal chairs. This privilege was reserved for one Xavier Pauchard (1880 – 1948). In 1908, the latter established a company selling galvanized metal goods and he committed his experience in this field in developing a new generation of furniture. Tellingly, “Chaise A” was not preceded by extensive preliminary studies or sketches, it appears to have sprung up directly in the workshop run by craftsman Pauchard. The latter knew how to lend his material of choice, sheet steel, an ideal shape. Like a tailor, mindful of the perfect cut he fashioned his chair, a three-dimensional creation consisting of 15 individual metal parts. 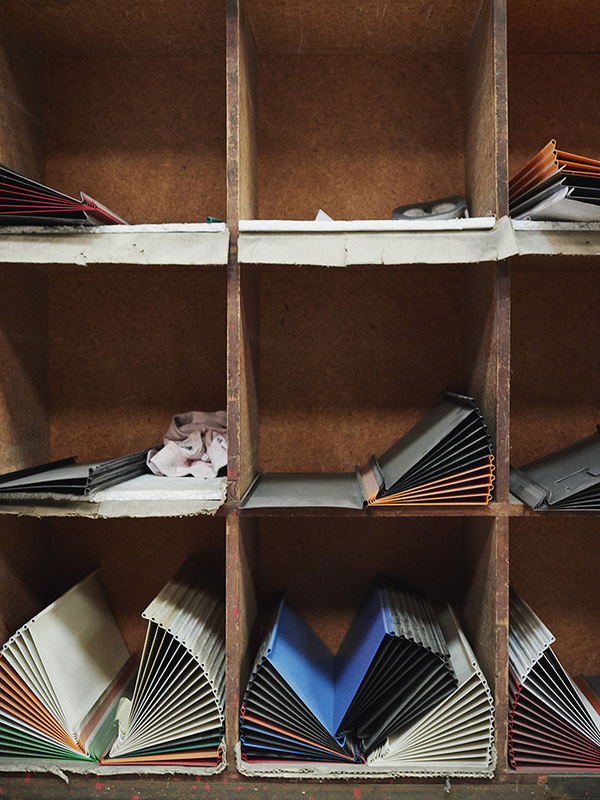 It took Pauchard eight pressing processes to shape his sheet metal, which was barely one millimeter thick. Even today, the chair’s low weight and its great stability are factors that mutually influence each other. Anybody who has ever folded a sheet of paper can understand the principle involved. Every fold augments the stability of a three-dimensional structure. But this was just not enough for Pauchard. He added diagonal cross-struts underneath the seat to further enhance the stability. As a final measure, the chairs were galvanized which left them largely unsusceptible to weathering. Anybody looking into the genesis of the iconic “Chaise A” soon realizes just how Pauchard unwaveringly continued to hone the outline of his chair and work on his material of choice, metal. To begin with, the chair’s solid legs looked as if they had been inspired by historical styles, reminiscent as they were of carved armchairs. By contrast, the filigree backrest with its slender curves was more reminiscent of bentwood. However, shortly afterwards Pauchard came up with a single coherent unit. The back section is a broad, comfortable strip inside a slightly curving frame, the legs are embossed which in turn enhances the chair’s stability. Basically, what Pauchard did was pre-empt the monobloc experiments conducted in the second half of the 20th century, the kind of chairs whose shape was derived from a single piece of a particular material. In 1932, Pauchard registered the brand name “Tolix”, a brand that was to focus exclusively on “manufacturing chairs, armchairs, stools and metal furniture”. When he furnished Expo 1937 in Paris, supplying several thousand chairs at the same time, the order was the equivalent to receiving a knighthood. From then on “Tolix” chairs came to be considered an integral part of public life in France. They were to be found in cafés, on boulevards and in parks and even on the deck of the proud Normandie belonging to the Compagnie Générale Transatlantique. This 303.75-meter transatlantic liner, even today thought by many people to be the most attractive of its kind, won the Blue Riband for the fastest crossing to New York only two years previously—with “Chaise A” along for the ride. Nowadays, people would doubtless say that the chair represented a testimonial to that quintessential French lifestyle and the country’s engineering skills. Tolix, c’est la vie! This feat of engineering was soon working its magic on the entire world and “Tolix” was to become the very epitome of well-designed industrial furniture. And this is exactly what the two famous constructors Xavier Pauchard and Jean Prouvé have in common. Their brainchildren hide nothing from the eye of the beholder; quite the opposite, in fact. They show off their workings, how they are put together. The construction itself has become the most important part of their designs. They both knew how to articulate the industrial age in their own elegant formal languages. It was this that France now present to the world – how to assemble a tricolor of elegance, durability and serial production. Materials took center stage as soon as Modernism rejected all the received traditions. From then on bentwood, tubular steel and plastic became the last word in seating. Chairs took their lead from the innovations introduced by the metallurgists, the engineers and the chemists. New materials were followed by new designs. The first items of serially produced architecture were made of cast iron and glass: Hot houses and cathedral-like stations and coffeehouse chairs of bentwood. Similarly, the Bauhaus classics would never have existed without the progress that resulted in tubular steel being used in the bicycle industry. However, sheet metal will forever be linked with Pauchard’s “Chaise A”. The latter’s no-frills title in itself showed the systematic approach characteristic of the Age of Engineering, the determination to tap the full potential of the industrial age. The rational shape of each “Chaise A” and the fact that it was industrially manufactured fulfilled everything that the Bauhaus called for—to make well-designed products affordable for everybody through serial production. An honest objective but something that most Bauhaus designs failed to meet. By contrast, Pauchard’s kind of Modernist design was available to everybody, affordable and there for the taking. Nonetheless, Pauchard remains a modest figure. And even the brand itself became a cult object mainly thanks to its understatement; its products remain radically authentic and the employees are proud of their work. Even today, chair designs remain one of any designer’s preferred jobs. The reason: the former enter a close relationship with their owners whom they have to carry and support. It is extremely unusual that the manufacturing process for “Chaise A” has remained almost unchanged for some 80 years without it degenerating into an uninspiring “classic”. And despite the fact that only 11 years ago “Tolix” was almost history, a brand on the point of extinction. Then in 2004 the employees, led by CFO Chantal Andriot, decided to take over the factory with its long tradition. 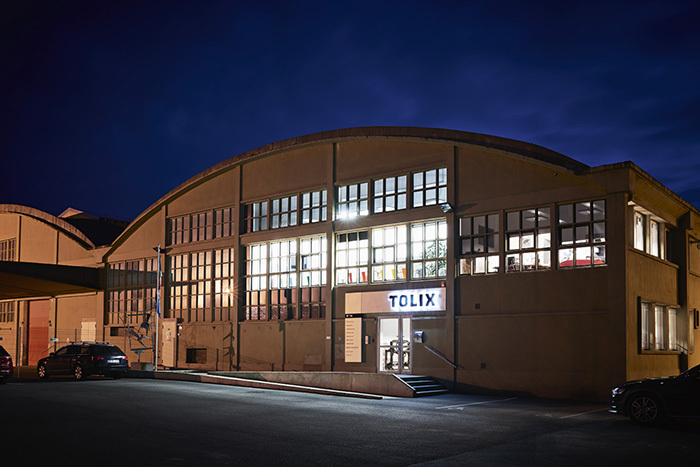 “At Tolix, quality means that ‘fabriqué en France’ is not just a slogan but represents real commitment to local development and quality.” Every worker at the factory in Autun is a specialist in his own field and every part of the production chain is subject to several checks. “Tolix” is investing in its infrastructure. As it has to be said, most of the machinery was almost as old as Pauchard’s groundbreaking design and dates from the 1930s. Even today, most of the approx. 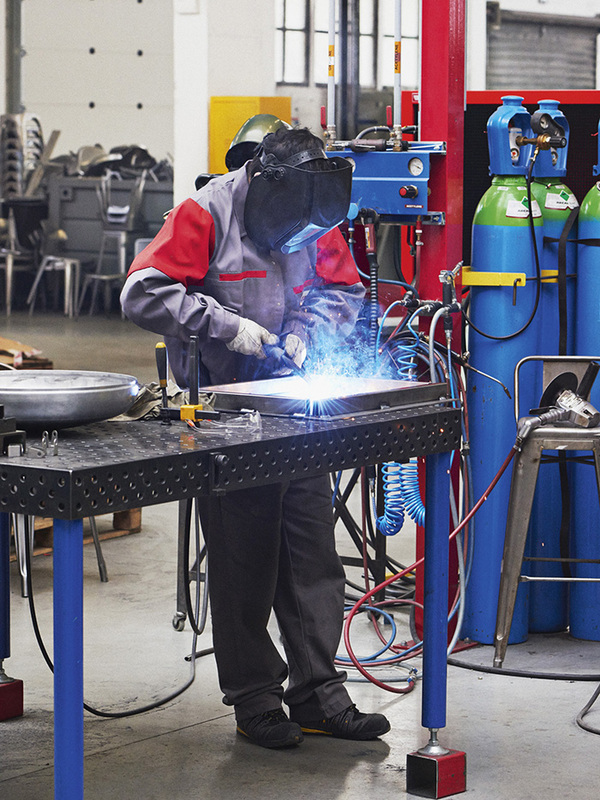 100 production phases are carried out by specialists. This iconic chair meanwhile sells in 27 countries and in 50 colors. Sometimes, the whole thing is reminiscent of Visconti’s “Il Gattopardo” and its motto that everything must change in order for everything to remain the same. And so Andriot has made the chair just that little bit more invisible by using perforated sheet. As well as adding a new name to the company’s range. And so, since last year, T14 by internationally fêted French designer Patrick Norguet has been making its own waves. The original model A, by contrast, steely and hot-dip galvanized, has for many years now been on show at the MoMA in New York, the Centre Pompidou in Paris and the Vitra Design Museum in Weil am Rhein.